Holocaust historian Deborah Lipstadt's book, "The Eichmann Trial" (Schocken Books 2011), is being released just prior to the 50th anniversary of the opening of the world's first internationally televised trial. But the trial's biggest legacy, she says, is that victims of the Holocaust got to tell their stories to a worldwide audience. Lipstadt's account provides a behind-the-scenes historical window to proceedings that riveted millions and revealed the evil behind the actions of Nazi Adolph Eichmann, chief operational officer of Hitler's Final Solution. 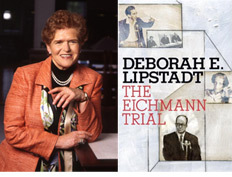 Listen to Deborah Lipstadt talk about the Eichmann trial and her new book. Listen to Lipstadt discuss how her writing of "The Eichmann Trial" was informed by her own landmark court case. Watch: What can we learn from the Eichmann trial?